The Barrington’s new end-of-trip (EOT) facility is a fully integrated zone that offers tenants an array of amenities including bike racks, lockers, showers and change rooms. ISPT’s ‘The Barrington’ is one of Parramatta’s A-grade office buildings and home to high-end tenants. 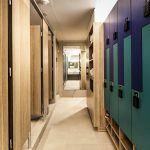 IA Design were appointed to work with Shead Management to install a new EOT facility into The Barrington, along with an upgrade to the lift lobby. 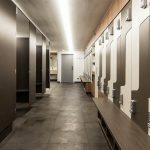 The IA Design team converted the existing toilets, refuse room and storeroom into 9 showers, 90 lockers, drying cupboards, joinery for towel services and 39 bike racks, both floor mounted and wall hanging. The design carefully maximised the tight space available, and the aesthetics provided users with a contemporary and fresh environment. The upgrade of the lift lobby complemented the new EOT facility, and was completed with stunning large format tiles were used (1.2m wide and floor to ceiling in height), new signage and new lights. The project was completed without disrupting day-to-day building operations and the end result was a stunning new environment for cyclists and runners to start their day. Following this project, IA Design were appointed to another ISPT building, 363 George Street.